Thank you so much for participating in the Pray A to Z series. What an exciting journey this has been. Thank you to each of the contributors who opened their hearts and shared their stories with us. This series would not have been the same without you. If you missed any of the posts, you may catch up here. Z was a tricky letter to come up with. 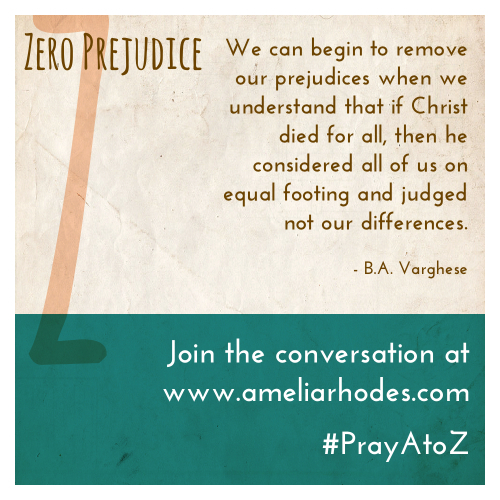 As I thought about what would we desire “zero” of in our communities, prejudice immediately came to mind. We see the tragic results of prejudice every day. Tough letter, tough topic. My friend, B.A. Varghese graciously agreed to tackle this topic. I think you’ll agree with me that he does so with insight, grace, and humility. My parents immigrated to the U.S. from Kerala State, India in 1972 when I was only one, and I spent most of my childhood growing up in New York. If I try, I can remember some of those memories only with a cloudy haze, except for a few that I can remember with the utmost clarity. I remember one vivid memory of being in class at an elementary school in Queens Village. I cannot recall how it began, but I do remember arguing with another student over a pencil that I had lent him. The teacher not knowing exactly what had transpired, only knowing that I started the argument, came over to me, looked me square in the face, and said, “Don’t be an Indian giver!” I remember her look and that the class went silent with everyone staring at me. I had an immediate awareness that I was different. At the time, I didn’t understand the expression she used, but only knew that she singled me out, pointed out my race, something I never thought really mattered, and warned me against an action that my race was known for. You can imagine how I felt, being of a different skin color, from another country, in a predominately white school. I apologized, but looking back, I feel at the time I was apologizing for being different. I understand the expression now and even though she was not targeting my race, it was still a statement that carried both a stereotype and a prejudice. These days with the current events around us, tensions are on a high with prejudices on both sides, not just isolated to race, but also relating to religion, gender, and class. We have all, at one time, participated in, or have been a target of prejudice. I by no means am an expert on this subject and there are others far more skilled to explain the social psychology behind prejudices. I am merely writing to shed a small light for us to begin to understand how we can come close to zero prejudice in our community. First, let’s look at what stereotypes and prejudices are and how they are linked. Keep in mind that these words have negative connotations in our modern society. When we encounter something or someone foreign to us, we make generalizations (stereotypes) based on our immediate experience or knowledge of the object or person. We generalize because it may be our human nature to categorize things, a way for us to understand by labeling it and placing it in a box. Yet, not all generalizations or stereotypes are negative and can at times be positive, such as mothers are nurturing or clowns are funny. Growing up, I loved watching those Saturday evening Kung-Fu movies and even acted out some moves with my friends. As a kid, I thought all Chinese people knew Kung-Fu (stereotype) and thought how awesome it would be to be Chinese (a preference toward this stereotype). I believed this until I met a friend in middle school who was Chinese and didn’t know Kung-Fu or any other martial arts. I was as surprised as he was when he learned that I was from India and I liked hamburgers (a stereotype that all Indians are of the Hindu religion and do not eat meat). Though these stereotypes are benign, since we understood the error in our generalization and we learned that we are far more complex than our first assumptions about each other, positive stereotyping can sometimes be harmful as well when we judge something or someone that doesn’t fit the stereotype (something is wrong with a clown who is not funny or with a mother who is not nurturing). Our mistake is with our attitude toward the stereotype. When we start placing judgments on our generalizations, we allow prejudices and stereotypes to go hand in hand, almost affecting each other like a cycle. We make generalizations that form in us biased opinions and judgments which in turn make even more generalizations (stereotypes). Unfortunately, failing to understand that we are all different yet human can lead us down darker paths where our stereotypes and prejudices, fueled by ignorance, hate, anger, fear, and frustration, turn into discrimination and desires of total obliteration of the things and people we are against. How do we combat such a force? How can we work toward zero prejudice? In Luke 10:25-37, an expert in the law, knowing the command to love one’s neighbor, tests Jesus by asking him, “And who is my neighbor?” Jesus replies with the parable of the Good Samaritan. Almost all the Jews in this time period would have considered the parable to be an oxymoron since they could not understand how one can see a Samaritan in a positive light. Samaritans were considered to be non-Jews even though they claimed to be the lost tribe taken during the Assyrian invasion of the Northern Kingdom of Israel during 722 BC. Tensions were high with racial prejudices (Samaritans were considered to be a mixed race) and with religious prejudices (both sides believe the other to be heretics; a falsified version of the original Jewish faith) leading to violent confrontations between the two groups in the first half of the first century. In the midst of all the tension, Jesus’ parable shows how a Samaritan, despite the prejudices of the time, despite the discrimination against his race, moves beyond the stereotype and helps a downtrodden fellow human being, not just rescuing him from his current circumstances, but caring for his needs, in actions that can only be described as love. Now just imagine, the man who was robbed, possibly a Jew, waking up in bed at the inn, seeing that he was cared for after his tragedy, finding out that his own people left him for dead, and realizing his savior in the face of the one he hated. The impact of what one does out of love is far reaching. It is natural to feel comfortable with people that are similar in race, gender, religion, but in the end, we need to understand that we are all different, not allowing the differences to make one inferior or superior. We need to pray for our communities to not be limited by our stereotypes but be aware that we as people are far more complex than what we can perceive. Like the Good Samaritan, we need to understand that though we are different, we are all important and necessary in God’s eyes. We may not be able to erase stereotypes, for it may be the way we process and understand experiences, but we need to understand that stereotypes are just our assumptions of a few and not the whole. We can begin to remove our prejudices when we understand that if Christ died for all, then he considered all of us on equal footing and judged not our differences. We need to pray to be more accepting, loving, and sacrificial like Christ was, otherwise we are in disagreement with his death. If we ever want to reach zero prejudice in our community, it starts with loving our neighbor as ourselves. Father, Our world today is torn with strife. We are often overwhelmed by stories of hatred and prejudice. Reveal to us how we have been guilty of prejudice and stereotypes. Help us to see people who are different from us through Your eyes. We need Your help to love our neighbors as ourselves. Help us reach out in love to those around us and break down the barriers of prejudice in our communities. Amen. OED Online. Oxford University Press, September 2014. Web. Merriam-Webster.com. Merriam-Webster. 2014. Web. The American Heritage Dictionary of the English Language, Fifth Edition. Houghton Mifflin Harcourt Publishing Company, 2014. Web. Powell, Mark Allan. Introducing the New Testament A Historical, Literary, and Theological Survey. Grand Rapids: Baker Group, 2009. Print. Whitley, Bernard E., and Mary E. Kite. The Psychology of Prejudice and Discrimination. Belmont, CA: Thomson Wadsworth, 2006. Print.